Throughout the interview, Lahren wiggled with nervous energy in her seat and had a lively discussion with Noah about her views which, for the record, are controversial at best and unnecessarily inflammatory and pretty racist at worst. They covered an awful lot of of ground — Obamacare and how it was destined to fail; Donald Trump as a“level-headed and reasonable” person; First Amendment rights, and how immigrants should be “grateful” to be in this country. 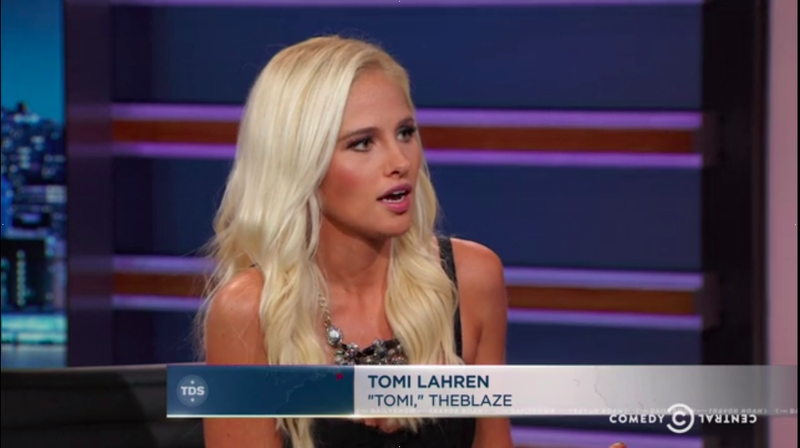 Noah made an excellent if not terrifying case that Lahren is now part of the mainstream media, as she argued against that classification, despite the fact that her very-popular show on The Blaze is an insanely unhinged display of the id of America empowered by Donald Trump’s imminent presidency. When asked whether or not she’s racist or what, she responded “I’ve never used racial slurs to address people.. To me, true diversity is true diversity of thought, not true diversity of color. I don’t see color.” Noah countered with a bit about how she handles traffic lights, but Tomi batted that away like a particularly irascible kitten. If you want to feel like you’re beating your head against a very loud wall, watch the entire interview below.